Just the other day marked one year since I did my first blog post. Although I was pretty much on hiatus for six of those twelve months being pregnant and not being able to stand the smell of any nail polish. 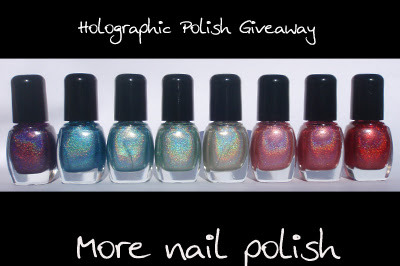 Anywho, in honor of my blogs first birthday, I'm giving away eight mini 5ml Artform holographic nail polishes. Colours are: Purple, Dark Blue, Light blue, Aqua Blue/Seafoam Green, Gold/Platinum, Light Pink, Dark Pink and Red. These have been decanted from my bottles, into brand new mini bottles. I'd love to give away brand new full sized bottles, but my giveaways aren't sponsored and unfortunately I just don't have that sort of money to spend. This way you are able to experience each colour, rather than just one or two. If you don't like the idea of receiving mini bottles decanted from mine, then please don't enter. You can get up to eleven entries, just fill in the form at the bottom. Even non-bloggers can get multiple entries by filling in the survey questions. Closes 20 April 2011 - anywhere in the world. Winner picked by random number generator. These polishes are only available in Australia, and they don't ship internationally, so here is your chance to try some awesome holographic polishes. Some of these polishes only just arrived yesterday so I will be posting swatches of them to show you what you can win. But to get started, here are a couple. Lovely!!! thanks for the giveaway! Happy one year! Thanks for an awesome giveaway!! Congrats. What a cool idea. Thank you sooo much and congratulations! I accidentally hit enter on the form before finishing it so I resubmitted, is that alright? I totally understand IT you don't count my entry..
Amazing giveaway ! Good luck everyone ! love this giveaway .. submitted my entry a while ago .. hope i win .. Happy Birthday! 1 year! Woohoo!!! Love your blog! Super congrats on a year! :) I've recently discovered your blog, I like your photos a lot! I hope it is okay for me to participate. Congratulation on your one year blog anniversary! These holoes are awesome! Thanks for helping us smuggle the ozo's out of AU! I tried contacting them directly and offering them anything under the sun to ship them to me...but I got a no-go". Something about shipping chemicals being against the law or something. Nice giveaway :) Thanks for the opportunity! 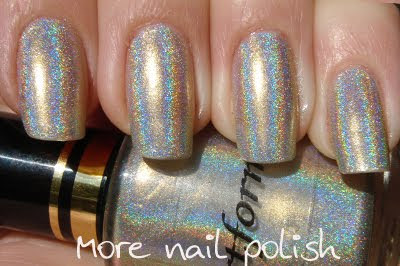 Lovely holo's where did you get them from? What are they called? Would love to buy if I can find out where from, i'm in the UK. Thanks. Congratulations and thank you! I can't stop staring at the purple! Wow, what an amazing giveaway. Happy birthday to you, one day I hope that my blog (which hasn't even been started yet) looks something like yours. such an awesome giveway! I'll keep my fingers crossed! What a great giveaway!! Thanks so much!! Thanks so much for the chance to win your awesome giveaway! happy one year!!! this is so exciting!!! thank you!!!!!!!!!!! I can't believe I missed your blog untill now, but thanks to this giveaway I found out about it! Great blog! I just started a blog, congrats for celebrating 1 year, I hope I can last as long..